Or text AUTO to 07546 814793 and receive a call straight back. We specialise in intensive courses. Text intensive and you will be contacted back with prices and availability. and a very good pass rate. Are you planning to take driving lessons in Glasgow and looking specifically for automatic driving lessons? Finding your automatic driving lessons Glasgow instructor can indeed prove to be a time consuming process. You will need to work with an experienced and reliable driving school to get your automatic driving lessons. Do not worry, we are here to take care of all your needs on Glasgow automatic driving lessons in the most efficient way possible. At Glasgow Automatic Driving Lessons, you will be able to find the most exceptional automatic driving lessons that Glasgow could offer. Our driving school uses the Toyota Yaris Hybrid, one of the most popular automatic cars in the UK for your driving lessons. 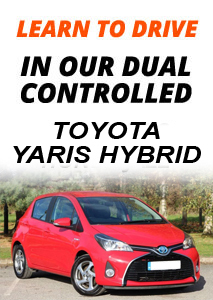 Toyota Yaris is a highly convenient automatic car to take your driving lessons. Our automatic driving lessons Glasgow driving school sets itself apart in the industry on several counts. Fully Qualified, Licensed Instructor – When you join our driving school, you will have access to fully qualified and licensed instructor. Instructor With Vast Experience – When it comes to driving instructions it is not enough that the instructor is qualified and licensed, the experience of the instructor counts. Our driving instructor comes with several years of experience in teaching people how to drive automatic cars. Friendly Yet Professional Style – You will find our instructor very friendly but at the same time very professional in delivering the lessons. You will find it very easy to approach the instructor to have your doubts clarified. Pre-planned Lessons – Each lesson is pre-planned to suit your learning pace. You will receive customised driving lessons. Your time will therefore be put to the best use. Individual Attention – Each student will get individual attention and the instructor will help the student identify one’s strengths and weaknesses in driving. Special attention will be given to unlearn faulty driving styles. Ultramodern Tuition Vehicle – We make use of one of the ultramodern tuition vehicles, Toyota Yaris for our driving lessons to help you understand the basic concepts of driving an automatic vehicle in the most effective way possible. Tuition Vehicle In Top Class Condition – Our tuition vehicle is serviced regularly and will be in excellent condition so that there are no glitches during the driving instructions. We value your time and more than that your safety is our priority. Flexible Timing – We are flexible with the timings for your Glasgow automatic driving lessons. You can choose the most convenient time for your lessons. High Pass Rate – We take pride in being one of the automatic driving schools with a very high pass rate in Glasgow. What are you waiting for? Do not postpone any longer. Call us now to book your automatic driving lessons in Glasgow. If you have any further questions regarding our automatic driving lessons Glasgow services, do not hesitate to contact us and we will be happy to assist you.